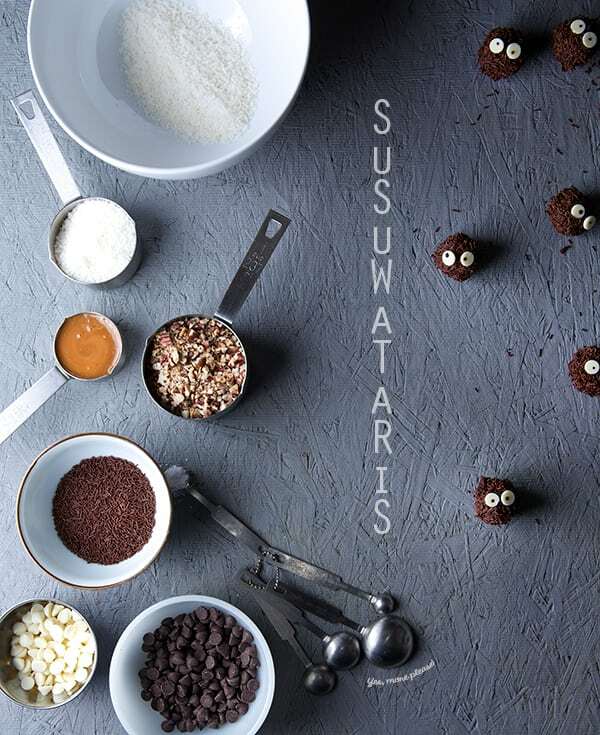 Chocolate Coconut Pecan Susuwataris ~ Yes, more please! I must warn you, if you decide to watch any of Hayao Miyasaki movies you will get addicted to them, just like you will with these Chocolate Coconut Pecan balls. 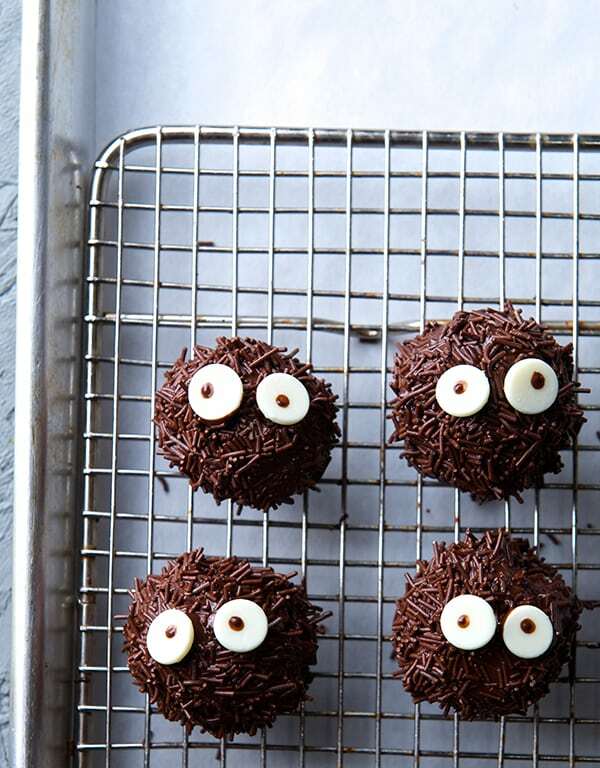 These lil chocolate creatures are not only cute, they taste ridiculously good. Collect a very few ingredients and you will be in homemade candy making land for this Halloween, or any chocolatey weekend. Making these creatures is as easy as 1-2-3; mix dry ingredients in a bowl along with the infamous “Dulce de leche” or Cajeta. 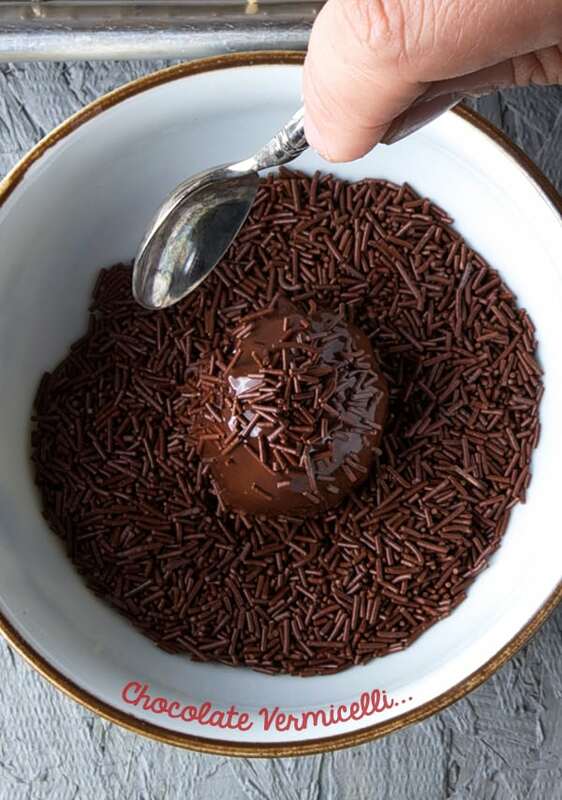 Wet your hands and press some of this mixture into small balls, cover in melted dark chocolate, toss into dark chocolate vermicelli sprinkles, add a pair of crazy white chocolate eyeballs…Refrigerate… Bite. Eat. Repeat. What is not to like? 1 good healthy and generous pinch of kosher or sea salt. 4 oz. Bitter sweet Dark chocolate chips 70% my preference. 1 – 2.6 oz frisk of Dark Chocolate Vermicelli, I used Indian Tree brand, Callebaut or Barry will be awesome! * I used Cajeta Coronado, its a Mexican brand. or you can make your own by boiling a can of condensed milk submerge the can of condensed milk into a pot filled with water, boil for about an hour. set a side remove can from water until water is cold. open the can and you will have dulce de leche. 1. In a bow, mix fine shredded coconut, toasted and finely chopped pecans, salt, and dulce the leche, mix well until you have a sticky mixture they holds together when you press. 2. Wash your hands, and set a little water bowl aside you. Wet the tips of your fingers and grab about a tablespoon of the mixture, press and shape into a round ball the size of a 25 cent coin. 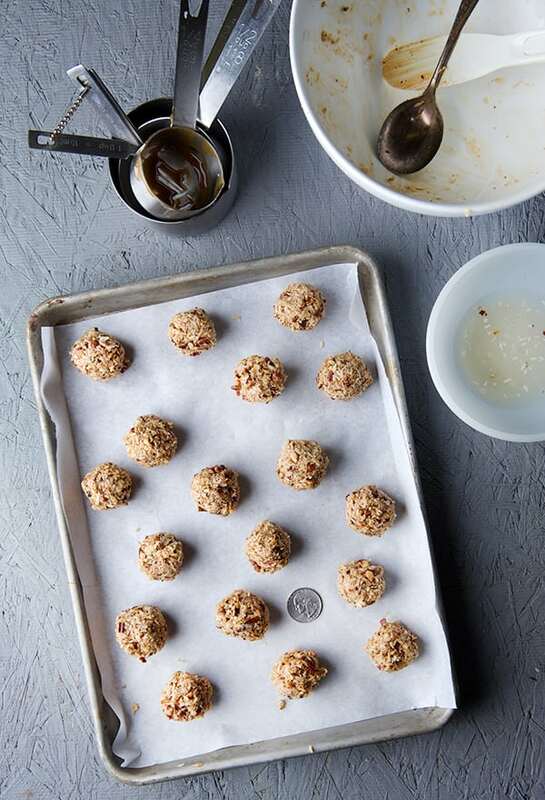 set on a tray lined with parchment paper, and proceed with the rest of the mixture until you have about 14-16 balls. 4. 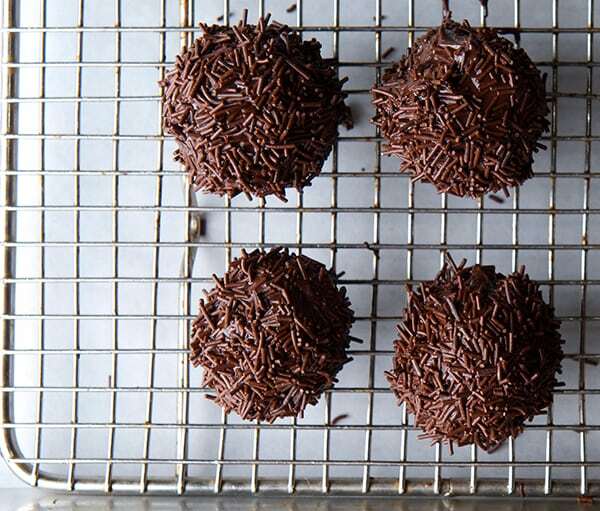 Remove the coconut balls from the refrigerator and dip them in to the melted chocolate cover well and tap to remove the excess chocolate. Dip about 4 and place them into a cookie rack. let the chocolate set a bit. 5. 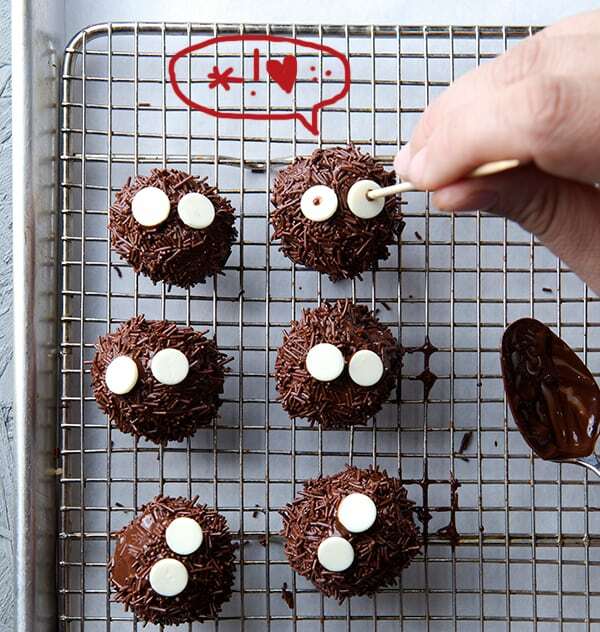 With the help of a fork and a tooth pick, toss each ball into the chocolate vermicelli one ball at a time. Use a spoon to help toss the ball until well covered. transfer the ball into the wire rack. 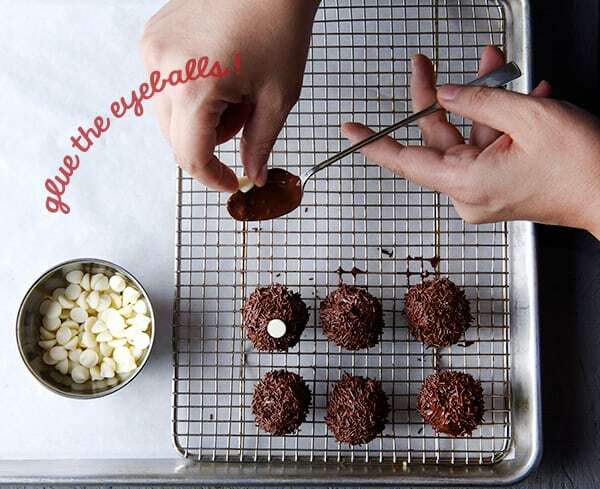 6. once you cover them all, use some of the left over melted chocolate to glue the white chocolate chips as eyeballs. place them flat side up, close together. 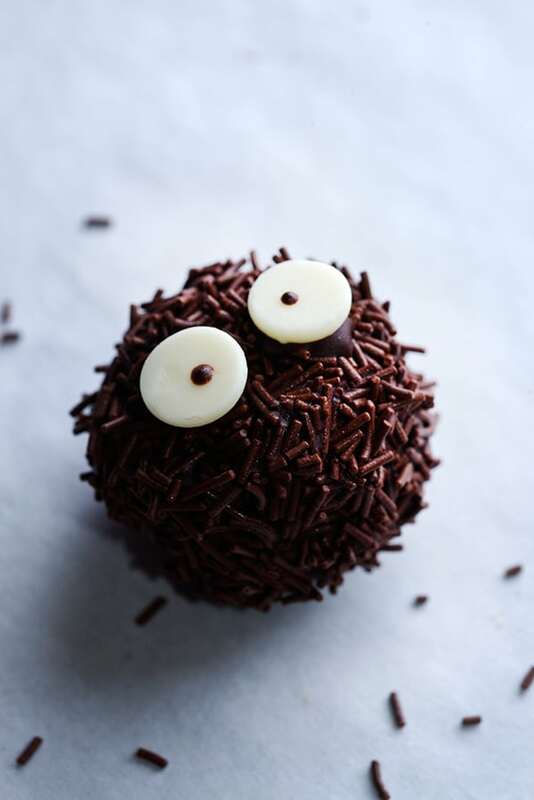 Then with the help of a bamboo skewer using the flat side end, dip in chocolate and gently tap a dab into the flat withe chocolate chips to make the dark pupils. Make them with crazy eyes, give them some character, have fun! Place them into the refrigerator for 15 minutes or until chocolate is hard. Now eat them while you can! 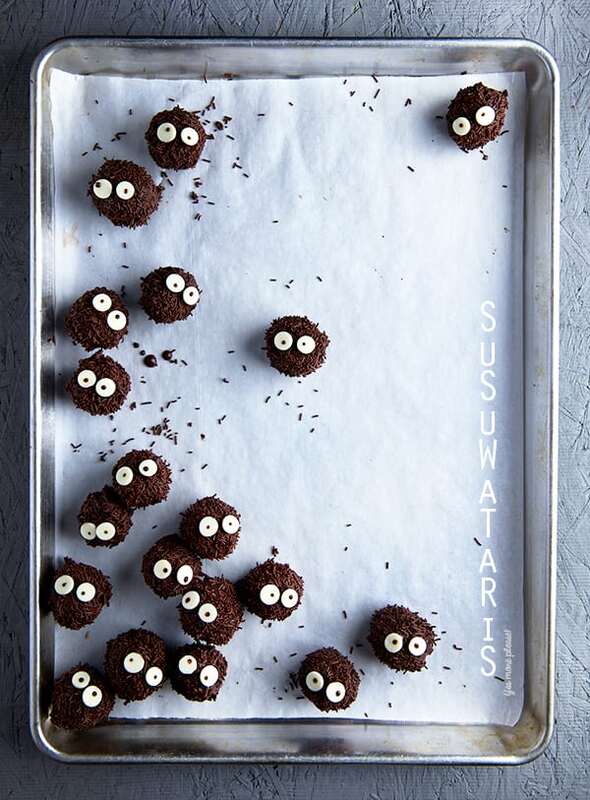 they will be gone on a blink of an eye, Spooky enough yet funny and delicious…Just make them, bite into them and go nuts about this all natural lil halloween snacks! If using a double boiler, do not allow the top bowl to touch the water, this will prevent the chocolate to over heat, and burn. Let the chocolate chips and coconut oil warm trough before mixing, this will prevent clumps when melting. If the chocolate gets to warm it will thicken up, making it clumpy it will not feel runny even if its to warm.If this happens to you, remove from double boiler and allow to cool down until temperature drops and its runny again. 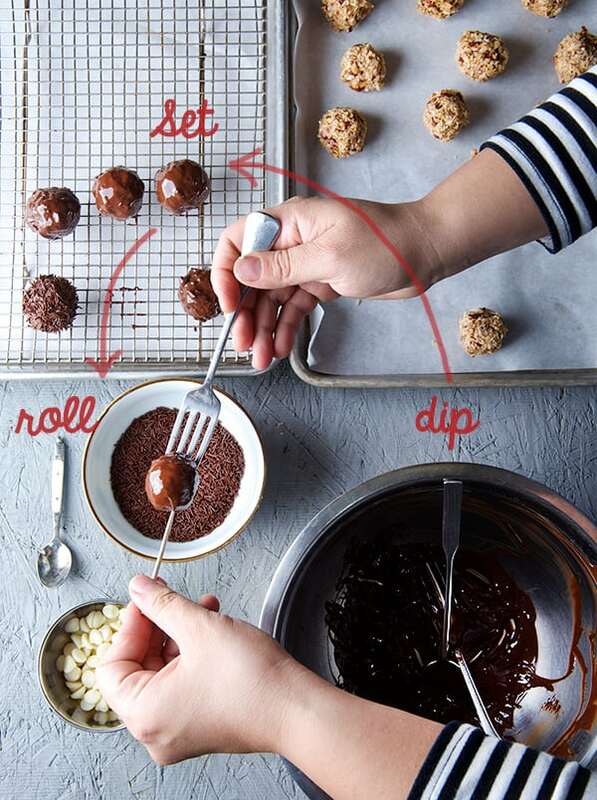 It is very easy to improvise a double boiler, use a small pot with 1 inch of water on the bottom and place a bigger diameter glass pyrex bowl, or a stainless mixing bowl on the top. The key is that the top bowl should not touch the water. It is the steam what will melt the chocolate. Have fun!